St. Louis Cathedral in New Orleans recently had its first archaelogical dig - and an interesting array of artifacts were unearthed (including a silver crucifix and traces of previously unknown buildings dating back to 1718). 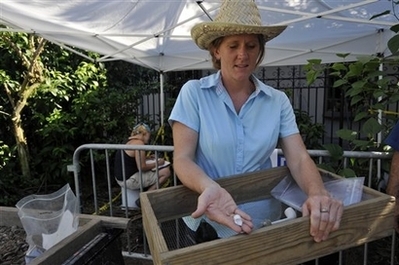 Shannon Lee Dawdy, an assistant professor at the University of Chicago, is the lead archaelogist of the project. Dawdy and eight students spent a month excavating St. Anthony's Garden, a fenced area behind the cathedral. After Hurricane Katrina, the cathedral received a Getty Foundation grant to restore the garden and dig into its history. Other finds have included clay pipes, children's marbles, and remains of china dolls. The most significant find is the foundation of a hut where a mixture of French artifacts from the early 1700s and fragments of Native American pottery were found. NOLA.com has a video available online from the dig. The floodgates at the Bonnet Carre Spillway were opened this spring for the first time in 11 years. 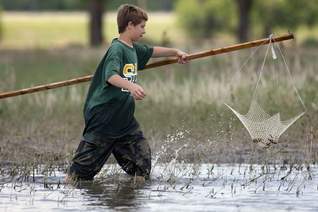 And dozens of people spread out across the 8,000 acres in search of crawfish - and this year they are especially large due to a shot of freshwater. Because of its protection under the Endangered Species Act, it can not be hunted, killed or have its habitat taken. The estimate is that there is between 500 and 1,000 bears in the state now, according to the Black Bear Conservation Committee. To be removed from the list, there must two sustainable sub-populations of black bears on protected habitat, and there must be a protected corridor connecting the two populations to allow for genetic interchange. Stop into Dickie Brennan's Steakhouse, Palace Café or Bourbon House for lunch anytime between Wednesday, June 27, and Friday, July 6, (except July 4th when all the restaurants will be closed) to try a taste of pure American gastronomy. Commander's Palace has resurrected the Great American Hot Dog Challenge and has asked Tom Fitzmorris to name an official winner on July 3rd. The following Brennan family restaurants will be participating, all aiming to win bragging rights among cousins: Bacco, Ralph's on the Park, Redfish Grill, Commander's Palace, Café Adelaide, Mr. B's Bistro, Bourbon House, Palace Café and Dickie Brennan's Steakhouse. Palace Cafe - Chicago meets New York and comes together in New Orleans! A combination of Chicago style Vienna beef and New York style veal "white hots" in a bacon wrapped swirly dog. Served on top a griddled manchego poppy seed bun with pickled mirliton & green tomato relish, melted manchego cheese, mustard and Creole tomato ketchup. Accompanied by grilled, fried red onion rings and BBQ red beans. It is Louisiana, so one of the restaurants will use boudin in the competition, I'm sure. Or I will be disappointed. 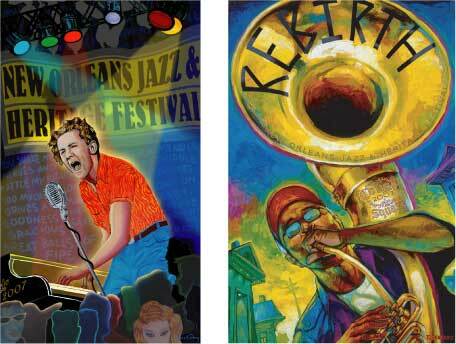 New Orleans will be the setting for a national conference, Restoration 2007: Innovation, Networks & Leadership, on May 2-4. The conference will focus on how to foster community redevelopment and revitalization following a disaster. Among the experts offering solutions will be Dr. Edward Blakely, executive director of Recovery Management for the city of New Orleans and Douglas Brinkley, author of The Great Deluge. 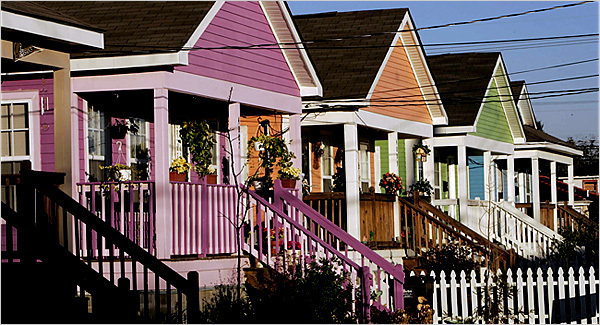 The Restoration Town Hall Meeting Plenary will focus on "Rebuilding a Sense of Place After a Disaster." David Meeks, city editor of The Times-Picayune, will moderate. To register or for more information, visit www.restoration2007.org or call (202) 289-4262. Rod Stewart, Norah Jones and Brad Paisley will join New Orleans favorites such as Irma Thomas, Dr. John and Allen Toussaint as headliners for this year's New Orleans Jazz & Heritage Festival. The festival, which is held over two weekends in April and May (April 27-29, May 4-6), will be held at the New Orleans Fair Grounds. Other headliners on the roster include Van Morrison, Ludacris, Bonnie Raitt, Steely Dan, ZZ Top, John Legend, Counting Crows and New Edition. Harry Connick, Jr., a New Orleans native, will close the festival. He is expected to perform selections from his Oh, My Nola album. Dickie Brennan's Bourbon House in New Orleans has begun a society for both the budding Bourbon enthusiast and the Bourbon connoisseur - the New Orleans Bourbon Society. Membership in the society is complimentary, and a series of member events are in the works for 2007. The inaugural celebration of the society on Thursday, February 8th, will include a tasting with a variety of Bourbons and a cocktail party serving an array of savory hors d'oeuvres created by Brennan's chefs. The cost is $25 and reservations can be made by calling 504.274.1831. Through a guided tasting by a Bourbon expert, guests will learn the language of fine Bourbon. Many will find that the terms associated with tasting Bourbon are strikingly similar to the language used with wine. Many wines are also aged in oak barrels, and just like fine wines, fine whiskeys are meant to be sipped and savored. At the event Ponchatoula Strawberry Mint Juleps, Eagle Rare Sidecars and Bourbon classics will be mixed. Chefs Neil and Amy Mockovak will be serving chilled seafood salads, turbo dog marinated mussels, assorted gourmet chesses, specialty dipping oils, house-made grilled breads, oysters on the half-shell, smoked catfish mousse and other foods selected specifically to complement the Bourbon. Become a member of the New Orleans Bourbon Society here. Microwave Park, starring Robert DeNiro and Curtis "50 Cent" Jackson, is set to film in Shreveport and New Orleans. It's a good-cop/bad-cop movie set post-Katrina. Production will begin Jan. 15 and will last six to seven weeks. Drago’s Restaurant, a New Orleans dining institution known for its charbroiled oysters, will open a second location in the Hilton New Orleans Riverside located in downtown New Orleans. The expansion is expected to be complete in early 2007. Drago's Restaurant opened in February 1970. Drago’s owner Tommy Cvitanovich will have a presence at the new restaurant as well as the original Metairie location. The look and feel of the Metairie locale will be recreated to a 382-seat restaurant on the first floor of the Hilton. The restaurant will also feature the same popular menu with its legendary lobster dishes and other signature plates such as Drago’s Original Charbroiled Oysters and Mama Ruth’s Gumbo. The menu prices will also remain the same.